Give the gift of comfort to your son, nephew, grandson, or friend! 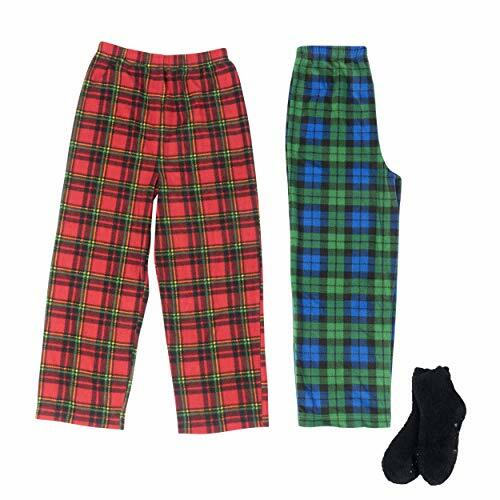 This two-pack of pajama pants with comfy socks makes a great gift for any occasion. These soft, quality-made pants allow children the freedom they need to move around in bed while also being secure enough not to slip off, thanks to the covered elastic waistband. The warm non-skid socks that accompany this set are safe enough for even the most active of children. The socks feature safety grips that will prevent your child from slipping as he runs excitedly on the hardwood floors of your home on Christmas morning. Each set includes two pairs of polyester Micro fleece pants. As a parent or guardian, we know that you expect the best from the products you purchase for your children. When you purchase products from Mad Dog Concepts, you can know that you're receiving the best quality sleepwear available on the market. We employ a talented in-house design staff and have advanced factories to help us maintain high industry standards. Our sleepwear set is sure to meet your high standards as it is made from 100% polyester, which is flame-resistant and meets governmental and environmental standards. It also features two unique plaid designs that your child will love. We were established in 2001, specializing in the design and manufacturing of comfortable pajamas for families, especially toddlers, and youth.